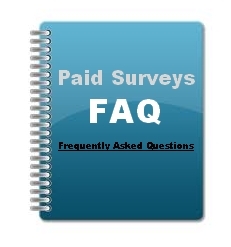 In this Paid Surveys FAQ section, I will try to answer some of the most commonly asked questions about surveys. If you have a question you don’t see an answer to, please feel free to send me a Tweet @SurveySatrap, comment on SurveySatrap’s Facebook page, or use our Contact page to get in touch with me. I will update this page with your question answered. Paid surveys, aka market research surveys, carry a set of questions that are put to individuals or a group of many individuals to gauge their perception and response to a certain product or service. Now, every product or service is marketed to a particular demographic. For example, athletic products are advertised to a physically active and younger demographic while the promotion of luxury vehicles is towards a high income demographic. So naturally, different surveys target different demographics based on what the survey is about, which is why you don’t qualify for every available survey, and that’s also why sometimes in the middle of a survey, you get kicked out because your answers indicated that you do not belong the demographic that particular survey was targeted towards. Yet another version of surveys, focus groups bring together a specific number of individuals (admitted through invites) and encourage discussion on certain topics that are relevant to the organization/company sponsoring a particular focus group. The main topic of discussion (which is moderated by an individual) might or might not be intimated to the participating individuals. A focus group can either be conducted in a real setting or online, and the duration is usually around 30-120 minutes. The compensation here depends upon the topic of discussion and the amount of time spent, ranging between $40 to $400 or more. Why does what I think matter so much? It’s a known fact that companies are habitual to spending huge sums of money to advertise their new and existing range of products as well as services. Now, an advertising initiative can be a huge waste of money and time if a company aims to capture a market without first studying it. This is why it’s useful for companies to see the kind of reaction they get from the general public regarding certain products/services, before pumping money as well as time in developing the product in a large scale. And companies get that reaction, initial feedback, through surveys and focus groups. I get that, but why someone would pay me for this? The reason you get paid money is quite simple and straightforward: Your time equals their money! Here’s an example to help you understand – If a company intends to introduce an innovative tennis racket in the market, wouldn’t it be more prudent and wise if it pays seasoned tennis pros for their opinions on this new product rather than invest millions in advertising the product right away? But I’m not a tennis player, you might say! But you are a consumer and as a consumer your opinion on products and services you use is just as important and valuable to the companies making and offering those products and services as the opinion of that tennis player, for the company that is trying to make that new tennis racket. Why do they need personal information from me? Once you join any survey site, you’ll be required to complete a profile that usually asks for details regarding your personal as well as family habits. Filling out this profile helps in increasing the likelihood of you receiving survey invitations. If you recall, earlier we talked about demographics and how surveys are normally targeted towards specific demographics. That is the reason why survey companies ask you to fill out your profile. Their internal system than uses that information to match you up with surveys that are targeted towards the demographic you belong to. That said, you can be completely sure about the safety of your data as we are talking about very well-known and reputed companies here. You will also not receive spam mails. The only emails you will receive from survey sites you signup with are survey invitations and perhaps updates and news about the panel. How much money can I make from answering paid surveys? The typical compensation for surveys ranges from $1 to $75 per completed survey. Most surveys can also be wrapped up in 6-12 minutes at the most. Some of the companies tend to pay you by way of points, which can (after a certain minimum limit) be exchanged for merchandise, gift certificates, prizes and cash. There are many that pay cash via PayPal or by Check. Thankfully though, it seems like most companies are moving towards that direction. Some also enter you into raffles carrying prizes for answering certain surveys. Regardless of the actual compensation, a genuine survey company will inform you about the exact compensation every survey entails. And normally, the longer a survey, the higher is the payout. Can I quit my day job? The simple answer would be NO! Yes, you can earn a decent amount of money by signing-up with a number of paid survey websites, completing every profile and regularly answering all surveys coming your way. However, that income would still not match up to the one from your regular job. That said, it’s a great way for stay at home moms, students, retirees, people out of job, or in fact anyone who is looking to earn a little extra cash in their free time without getting a second job. Some of the survey sites pay you for every survey taken via check. This check is sent to you by mail, which usually takes some weeks after you complete your survey. Some companies choose to mail you checks on a monthly basis once you have achieved the minimum balance for your account. A lot of companies these days have started paying their panelists via PayPal. That said, many sites also give you the option to redeem your earnings for gift certificates form various online and offline stores such as Amazon.com and Walmart. With surveys, you will operate on your own and as such, the responsibility lies with you to file taxes on the money you’ve earned. Generally, if you make more than $600 a year from a company, you will have to file taxes for that income. Can everyone take paid surveys? Almost anyone can take paid surveys by signing-up with survey sites. However, some survey companies tend to carry minimum age requirements. For instance, a few may require survey takers to have completed 13 years of age while a few others might require survey takers to be legally adults. Do I ever have to pay anything? No, legit survey sites do not charge you a dime! They are there to pay you for your opinion, not to charge you for giving them your opinion! Can I answer a paid survey only after fitting a particular profile? Whenever you sign-up with any company specializing in market research, you need to answer certain questions to see what profile you fit into. This knowledge then helps to determine which surveys or focus group invites you’ll be sent. There are thousands of surveys sponsored all the time by hundreds of different market research companies. More the number of sites you register with, more will be the paid survey invites coming your way. What type of questions do paid surveys ask? It all depends on the topic of the survey. And normally it revolves around your usage of the products/service and your opinion about it. How long have you been using the X shampoo? If you had to, what other shampoo would you replace it with? What do you like about the X shampoo specifically? All the questions of these paid surveys are designed to help companies understand the various markets they are trying to make a mark in. This is exactly why your opinions matter a great deal. Am I limited by the number of surveys I’m allowed to take? No. There are no limits whatsoever to the number of surveys/focus groups you can participate in a day, week or month. You can even choose to answer surveys all day long. That said, there are only a limited number of studies available at any given time with any survey site. Which is why it would make sense to signup with more than a few companies to increase the number of available surveys you can participate in. How will I know when a survey comes along? If there’s a survey about to commence or if there’s one that has already started, you’ll be notified about the same via email. The invitation in this email will carry a link to the said survey, clicking on which takes you directly to the survey’s beginning. There are a few survey companies that require members to install certain software on their computers for taking surveys, although most don’t follow this practice. Also remember that you are not obligated to complete any survey. If any particular survey doesn’t interest you, you have the right to quit then and there. How many surveys a month can I get? This depends a lot on your member profile and how many survey panels you join. Additionally, some sites tend to carry more surveys than others. For instance, SurveySavvy sends out less survey invites but its compensation per survey is nothing short of excellent. One of the surefire ways of participating in more surveys is by registering with as many survey sites as possible and filling out your profiles. The latter is important as it allows surveys sites to target their surveys towards a desired section of members. Lastly, where you stay matters a lot. People residing in the US will get a lot of survey invitations. Residents of countries like Canada, UK and Australia have fairly good chances of receiving frequent survey invites. However, people living in countries other than these have to make do with a far lesser amount of surveys. But there are certain companies like SurveySavvy, Brand Institute, and Global Test Market that send out a lot of survey invites to their international members as well. Why am I told that I do not qualify for a survey after I answer some questions? A lot of surveys tend to have a screening round that contains some questions to see whether you fit the profile that the survey company is looking for. It has to do with the demographic that the survey is targeted towards. If you are found a good fit, you’ll be allowed to proceed further with the survey. In case you do not, you are informed of the same. Usually, most sites reward such rejections with a free sweepstakes entry. However, don’t let a rejection dishearten you as there are always more surveys you can try to qualify for. Are there software programs available that can help me? If you plan to join lots of different survey sites, using a form filler can help you do it quickly since most survey sits have similar registration questions. This can also be helpful when completing your profile on the site. Roboform is a well-known program that can help you fill out forms quickly. The software is capable of securely storing your information and makes filling out forms a simple process. Roboform is also shareware and can be obtained for free. Are sites selling “List of Paid Survey Sites” worth my money? The straightforward answer would be NO. I’ve seen paid surveys labeled as scams – Is that true? While there are many reputed and legit survey panel that are backed by reliable market research firms, there are also many scam sites that do try to rip people off. So, it is always wise to do a background check on any given survey site you want to join. Participating in market research studies or online surveys is a great way to voice your opinion about products and services you use in your daily life. At the same time, you have the chance to make some additional income. But please be aware that it is highly unlikely for most of us to make enough money from paid surveys to call it a “work at home job”. In the end, make sure you research properly and unearth all that there is to find before signing up with any paid survey site.